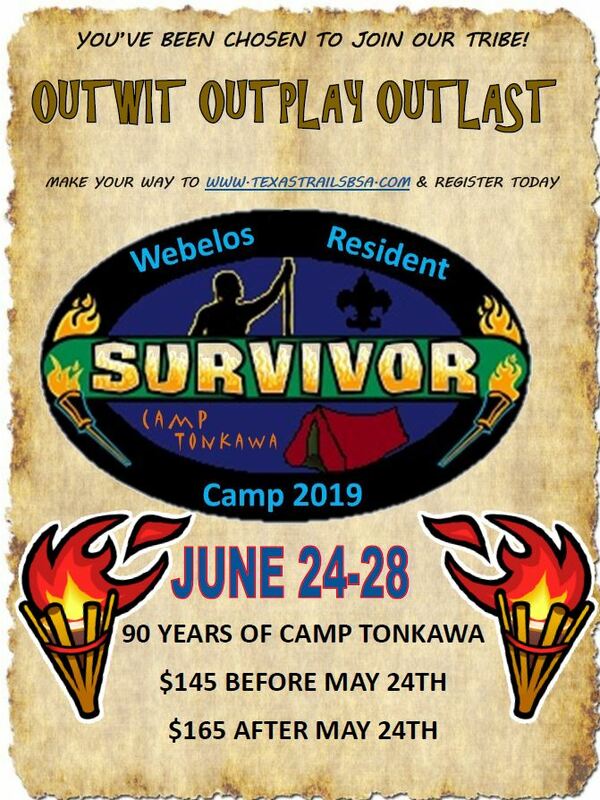 2019 Webelos Resident Camp Staff Flyer "A great way to spend your summer"
Youth that are currently Webelos and will bridge over into Arrow of Light on June 1 can register for this camp. If they are currently at Arrow of Light rank they cannot register because they will bridge over into Scouts BSA before the start of camp. It is not a requirement during the registration process however, please include the phone number and e-mail address of all adult leaders who are registering. This will allow us to contact them if there are any questions, concerns, or updates. Part-time leaders may register at camp at the cost of $22 per day. Part-time leaders are leaders that will spend less than 1/2 time at camp. Online registration will end at 11:55 PM on 6/20/2019. You can still register in person at the Council Scout Shop up until 2:00 PM on 6/22/2019 however, there will be a $50 late fee added to each registration. Before 5/24/2019 a discount of $20.00 will apply to all Adult Leader Registrants. Before 5/24/2019 a discount of $20.00 will apply to all Webelos Registrants. After 5/25/2019 a fee of $20.00 will apply to all Adult Leader Registrants. After 5/25/2019 a fee of $20.00 will apply to all Webelos Registrants.